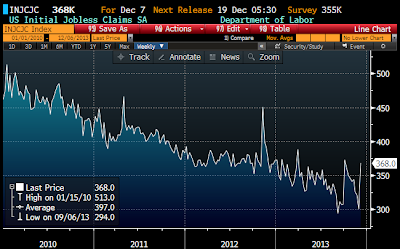 Seasonally-adjusted, first-time claims for unemployment jumped last week to +368K, much higher than the 320K expected. This is almost certainly a by-product of seasonality, which can be very volatile especially at this time of the year, and as such is likely to be reversed in the next week or so. The underlying fundamentals of the workforce are more accurately represented by the chart above. As of the end of November, weekly unemployment claims as a % of the active workforce fell to within inches of their lowest level ever. 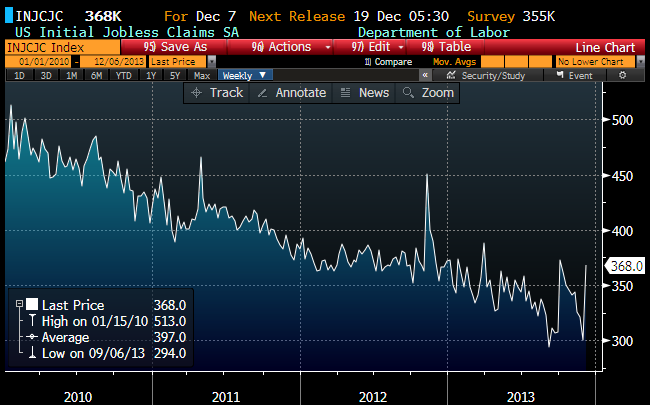 Employers are just not laying many people off these days, after adjusting for seasonal factors. This is a good thing. 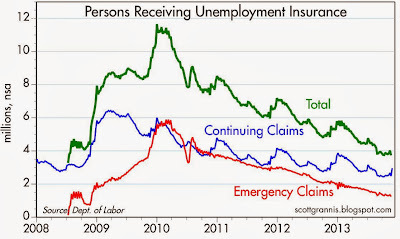 As the chart above shows, the number of people receiving unemployment insurance has been falling steadily for almost four years straight. 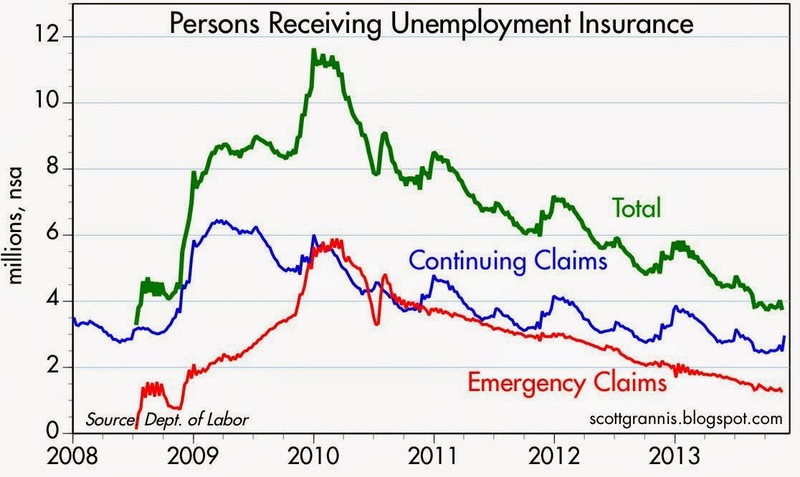 If the current bipartisan budget agreement survives, which seems likely, the "emergency claims" portion of this chart will go to zero next month—the program will not be renewed, and this will take about 1.25 million people "off the dole." The emergency claims program was an unprecedented action to begin with, back in mid-2008, and it has been renewed every year. 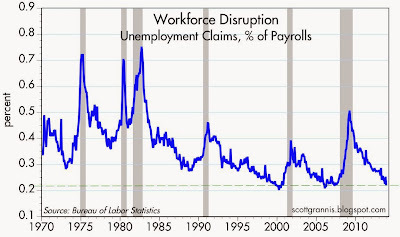 This has contributed to the sluggishness of the current recovery, as I explain here. So the termination of this program is likely to stimulate the economy to some degree next year, as well as contributing to lower the budget deficit. Come January, there could be as few as 2.5 million people receiving unemployment insurance compensation ever month, which will be the lowest since early 2007.